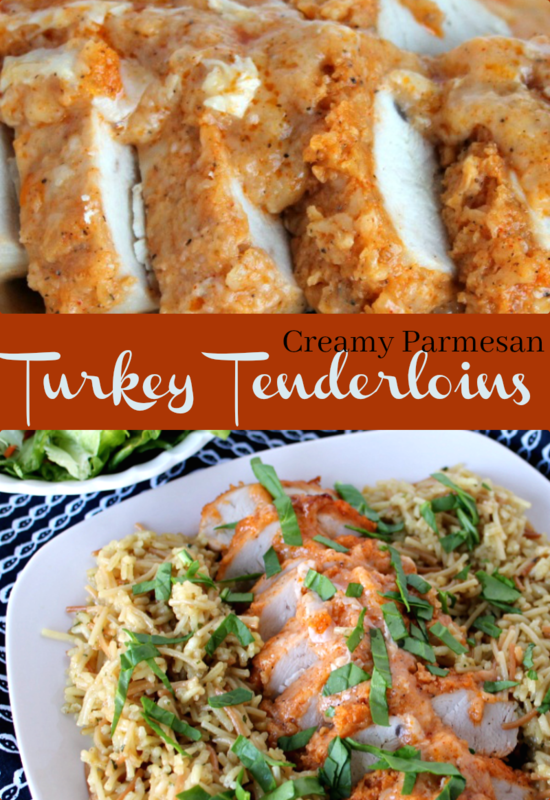 Creamy parmesan crust with a kick blankets turkey tenderloins for a quick and easy baked meal. Serve with a salad, brown rice and vegetable of your choice for a healthy dinner. A rice and pasta combination also makes a good side dish and you can pick a flavor to complement the zing of the creamy parmesan crust. Mix together the sauce ingredients. The seasoned salt provides the kick. You know I am a wimp so the half teaspoon is plenty for me, but you can add up to a teaspoon if you like. Slather the sauce evenly over the two turkey tenderloins and bake for about 45 minutes. Have a glass of iced tea and unwind after your busy workday and then for the 15 minutes before serving make the rest of the dinner. Prepare rice accompaniment according to directions. Toss a salad — or pull it already prepared from a bag. Add a nice creamy dessert like sugar free pudding or an ice cream bar. And you are ready for an evening on the go or snuggled up under a blanket with a magazine. Leftovers — if you have any — make a delicious sandwich or will warm up and taste fresh made. You can turn this into a prepared ahead freezer meal, by sliding the two turkey tenderloins into a gallon sized freezer bag. Measure the parmesan sauce ingredients into a sandwich zipper bag and moosh until well mixed. Throw the bag of sauce into the freezer bag with the turkey. You can put the rice side dish into a quart bag, with directions cut out and added to the bag. Add this to the gallon freezer bag as well to keep the meal ingredients together. OR if you are like me and have more pantry shelf space than freezer space, mark the box “Turkey Tenderloin” and set it in the pantry instead of freezing it. You can also add the bag of frozen vegetables to the gallon bag or mark them ” for use with Turkey Tenderloin”. This ensures that you will have all the components of the meal when you are ready to prepare it. I try to keep salad makings on hand all the time so I consider that a staple. Take the meat and sauce out of the freezer the night before planning to use it and set it in the refrigerator to thaw. In small mixing bowl place mayonnaise, parmesan cheese, seasoned salt, garlic powder, pepper and paprika. Stir to combine. Spray an 8x8 baking dish with cooking spray or brush with olive oil. Place turkey tenderloins in baking dish. Bake for 40 to 45 minutes, or until internal temperature reaches 165 on a meat thermometer in the thickest part of the tenderloin. I’m so glad you stopped by today! Follow A Pinch of Joy using the icons on the blue bar at the top of the page so you don’t miss a thing! I’d love to have your company on this venture!! Share: Pin so you have inspiration at your fingertips — share on facebook so others will, too! If you found this helpful or inspiring please click one of the other buttons below! Your support of A Pinch of Joy is appreciated!